When the inaugural SNIFFER Flood Risk Management conference was convened in 2005 many of the current approaches to flood risk management were very much in their infancy – if at all conceived. 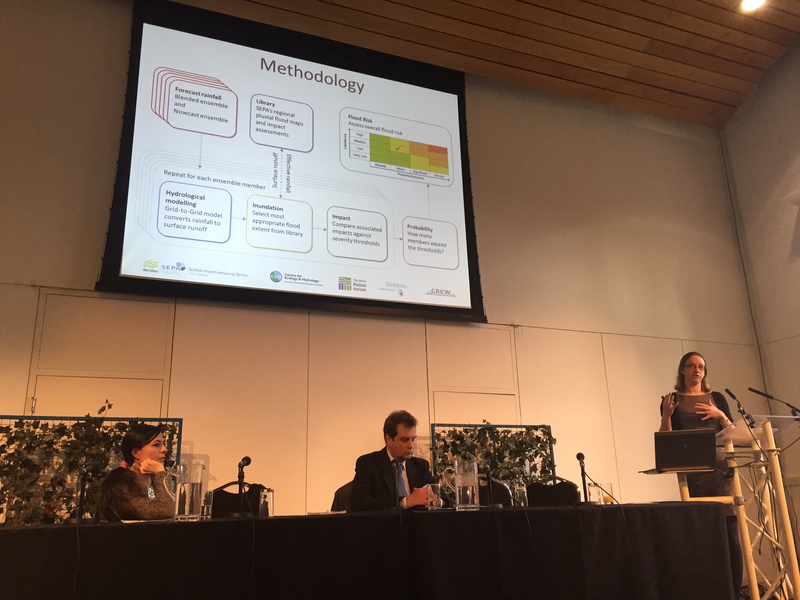 10 years on and the ‘FRMis10’ conference agenda– Scotland’s key event for exchanging ideas on flood risk management – is dominated with papers on approaches to resilience, natural flood management and climate adaptation. A catalyst for the changing approach has been the Flood Risk Management Act and associated policy drivers and investment. Opening the two-day event, the Minister for Environment, Climate Change and Land Reform – Aileen McLeod MSP – stated “partnership working is one of the key pillars (of the Act)… and it enables agencies to deliver co-ordinated, strategic policies;” this message being echoed further through work to promote partnership working and sharing knowledge (Morgan). As Scotland approaches the publication of the flood risk management plans later this year, then what is in store for the next 10 years for flood risk management? The key points for practitioners following this event seem to be data, scale and communication. It’s clear that our understanding of the risk has significantly improved over the past decade. Data and information on flood risk in the urban environment has been useful in surface water flood forecasting where a library of information (risk maps) were used to provide real-time representation of the risk to people, property and transport in Glasgow (Speight). However, can this approach be further developed by utilising the underlying urban flood inundation models in real-time and is this appropriate (Falconer)? What about our monitoring networks – what more needs to be done in the coastal environment (Faichney)? Certainly a good case was made for increased use of data through merging raingauge data and radar observations for improved rainfall estimates (Ochoa-Rodriguez). New approaches to urban surface water flood forecasting using hydrometeorological modelling and impact assesments to support hazard alerting. There are increasing demands but equally benefits on the scale at which we apply our science. Understanding the rates of coastal erosion can help assess the future risk of flooding (Rennie) and applying hydrometeorological forecasting at a 1km scale can help with hazard alerting (Speight). Likewise applying resilience measures at the community scale through empowering individuals (Throp) and promoting property level protection (Petit) can all have benefits for mitigating flooding as will making flood risk relevant to the individual. Yet who is responsible for maintaining the effort for these initiatives when interest wanes (Cubbage)? “The language is not easily understood by the man on the street” (Watson). Therefore how we communicate what we do is important and methods for communicating the future risk of climate change and public hazard should be a focal point of research if we are to make most of the science (MacDonald). 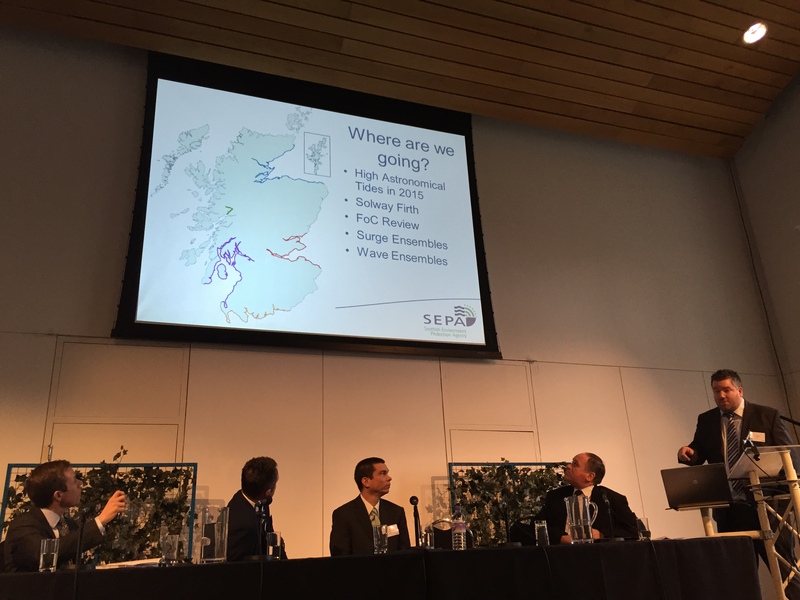 As concluded by the Minister, the recent property level protection research has highlighted that with small increases in river or sea level comes a substantial increase in the risk to properties; “Does this imply that the focus of flood risk management in Scotland needs to shift from extreme flood events to the more frequent lower return period floods? If yes, then this has important wider implications for flood risk management in Scotland when so much of our flood risk management focuses on the more extreme flood events.” Furthermore, all organisations should take a proactive role to potential issues by not ‘waiting for the complaints’ (Mustard) and aim to be prepared for the next emergency or hazard (Handling). This entry was posted in Coastal, Conference, Flood, Partnerships, Research, Risk communication, Surface Water. Bookmark the permalink.